If you’ve ever been to Wahoo’s Fish Tacos, you probably love their blackened fish as much as I do. 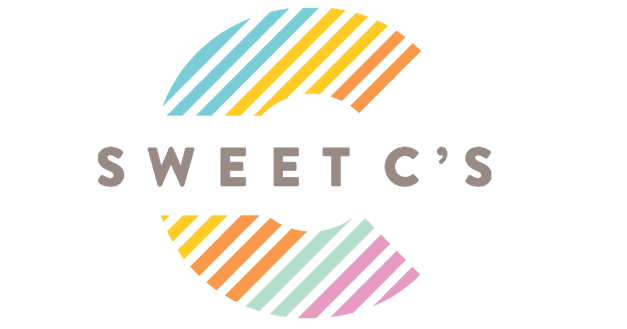 It makes a delicious meal- and their fish bowls are an addictive and insanely delicious food that I love. I’ve been craving a taco bowl lately but trying to cut back on processed starches- so I decided to come up with a paleo alternative. 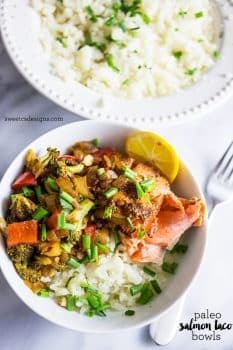 This Paleo Friendly Salmon Taco Bowl with Cauliflower Rice is a delicious, filling, and nutritious dinner that our whole family loved! This dish is low carb, full of vegetables and omega 3’s from the salmon- and is relatively low calorie compared to other taco rice bowls- especially since we’re using cauliflower to serve as our rice. I’m not a huge fan of cauliflower normally, but I really love it when made into rice for some reason! It’s obviously less starchy than rice, and absorbs flavors of seasonings around it really well. It also can be torn apart to have a similar appearance and texture, and is a great way to sneak an additional vegetable into your meal! For some reason, every time I think about making cauliflower rice, I chicken out. 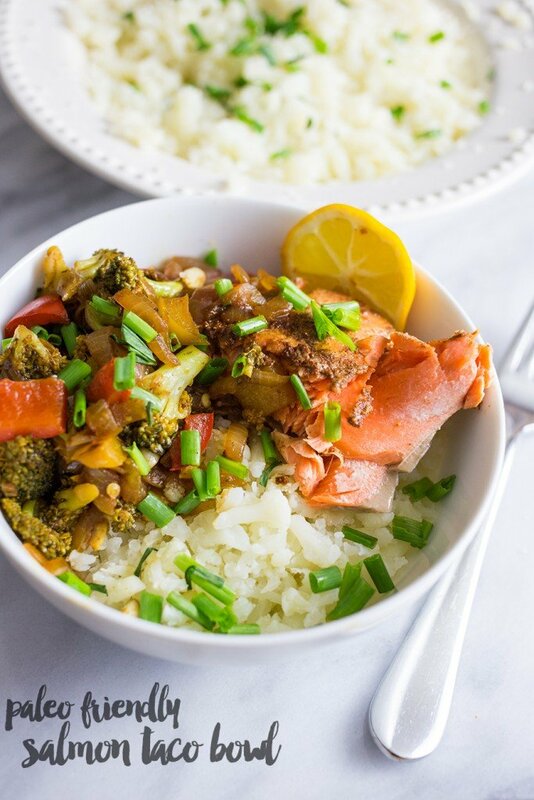 I don’t know why I do (it could very well be the distinctive smell of cauliflower boiling- not my favorite), but it is so easy to make that I need to do it more often. Plus it is so healthy! One of the things I always worry about is “ricing” the cauliflower, or overcooking it so it is too mushy. I’ve recently found though if I just slightly overcook the cauliflower- so its a bit squishy to the touch- I can just break it all apart with my hands quickly and easily, and I don’t have to use some kind of gadget to make it look like rice. Easy peasy! 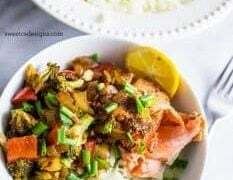 I’m not adding beans or cheese to keep this dish paleo (and Lent friendly, if you’re Orthodox like me, you’re probably skipping dairy during Lent- you can sub out the salmon for shrimp or crawfish) – but you can add them if you’d like. I prefer black beans with a little bit of lime drizzled over the top for this dish. This is delicious hot- but also makes for great leftovers. If making ahead of time, be sure to just undercook the salmon so it doesn’t dry out or get fishy during reheating. Trim excess leaves and large stem off cauliflower crown. Bring a large stockpot of water to a boil, add cauliflower and cover. Place salmon on foil and sprinkle with a little taco seasoning. 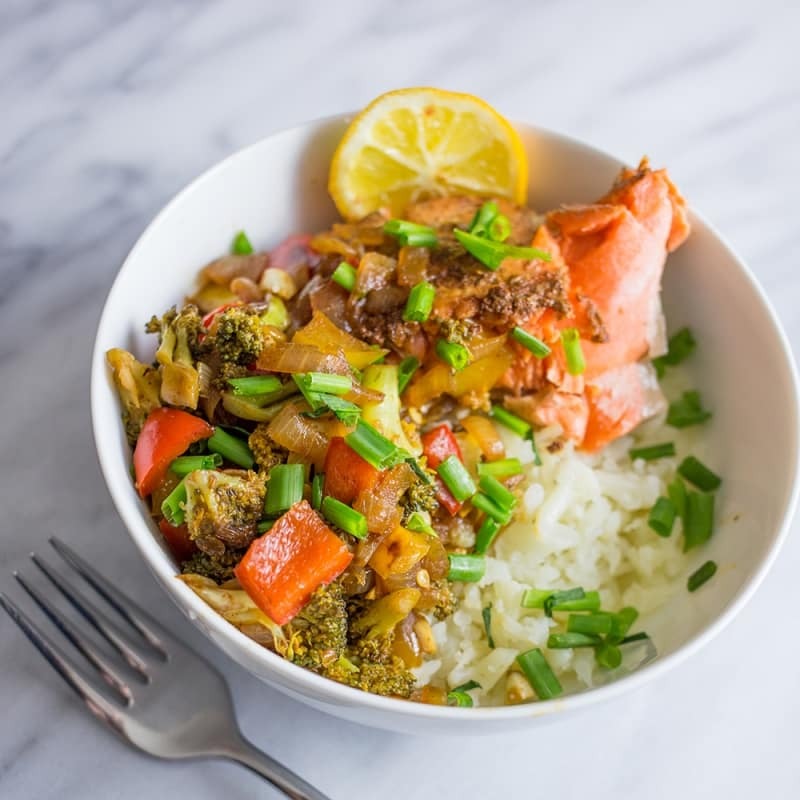 Place slices of meyer lemon over seasoning, and fold foil to make a pouch around salmon. Bake at 350 for 10 minutes- until salmon is cooked through. In a large, heavy pan, heat oil on medium high until shimmery. Add onion and peppers, cook until slightly browned- about 8 minutes. Stir occasionally to prevent burning. Add taco seasoning- add up to 2 tbsp of water if needed to help taco seasoning coat food. Remove cauliflower from boiling water when soft to the touch. Using your hands, crumble cauliflower into small shreds that look like "rice". 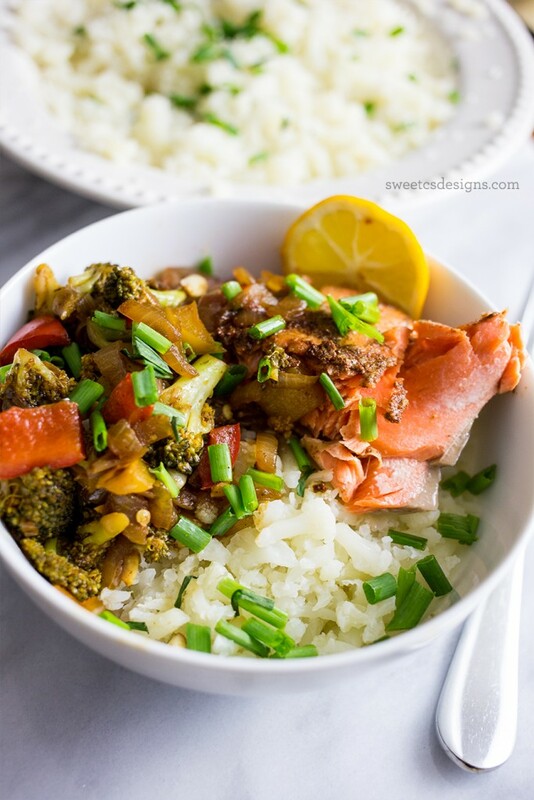 Layer cauliflower rice, seasoned vegetables and salmon in a bowl, garnishing with green onion. Squeeze a little meyer lemon juice over the top.